​The DARE (Dialogue about Radicalisation and Equality) project includes 17 partners in 13 countries - Belgium, Croatia, France, Germany, Greece, Malta, Norway, Poland, Russian Federation, The Netherlands, Tunisia, Turkey and the UK - and will run for four years. Funded under the EU Horizon 2020 Framework Programme, it will investigate young people’s encounters with and agents of radicalisation, how they receive and respond to those calls, and how they make choices about the paths they take. The project aims to broaden understanding of radicalisation, demonstrate that it is not located in any one religion or community, and to explore the effects of radicalisation on society. DARE will focus on people aged between 12 and 30, as they are a key target of recruiters and existing research suggests they may be particularly receptive to radicalism. It will approach young people neither as victims nor perpetrators of radicalisation, but as engaged, reflexive, often passionate social actors who seek information they can trust, as they navigate a world in which calls to radicalisation are numerous. Read More Here. 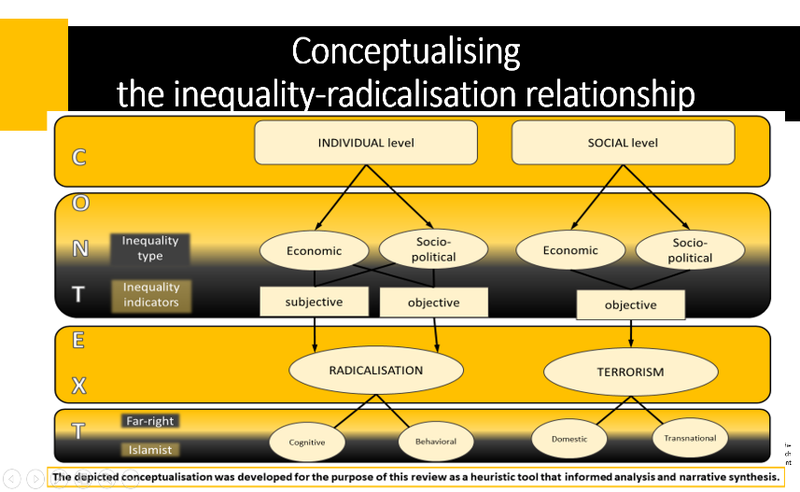 27 February 2019 DARE Colleagues Tomislav Pavlovic and Renata Franc have written a blog post discussing some of the key findings of the systematic review of quantitative (and mixed method) studies on the relationship between inequality and radicalisation. In short, the review indicates that reducing socio-political inequality could be even more important for preventing radicalisation than reducing economic inequality. Thus, policy makers should devote more resources to reducing socio-political inequality. Such efforts should target individuals and groups (communities) who are considered to be discriminated against, marginalised or targets of injustice; as well as ensure the social conditions that will facilitate a higher level of respect and fulfilment of citizens’ socio-political rights. ​Furthermore, policy makers should ensure that existing policies and measures aimed at increasing security and lowering the risk of radicalisation and terrorism do not increase perceived injustice and discrimination among targeted populations as such perceived injustice could increase receptivity to radicalised beliefs and lead to violence. Read the blog post here. The latest issue of The University of Manchester's On Cohesion magazine has two articles on DARE related topics. The first, an article by Professor Hilary Pilkington entitled: 'The pathway to violent extremism: is socio-economic inequality, or our perception of it, to blame?' and a second, by Ajmal Hussein entitled: 'Cohesion again? Learning lessons from the ‘between’'. Read the articles here. To understand what leads people into violent extremism, scientists are turning the question on its head and asking why it is that most young people don’t become radicalised. ‘Understanding pathways to non-radicalisation is as important to us as those that lead to radicalisation,’ said Professor Hilary Pilkington, a sociologist from the University of Manchester in the UK. Continue reading here.